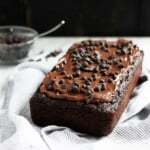 Super moist healthy chocolate zucchini cake with a silky smooth avocado chocolate frosting. Naturally sweetened & perfect to make as a birthday cake or for a special occasion! Guys, it’s me again. Back for day 3 of zucchini week with a HEALTHY CHOCOLATE ZUCCHINI CAKE. Let’s get crazy about it like we used to be for Justin Bieber. Jokes. We’ll get crazy about it because I know you guys are chocoholics. I looked at my Instagram stats the other day and most of my posts that do well just so happen to involved some sort of chocolate. Man, I just love you guys. But truth be told, we shouldn’t think of chocolate as indulgent all the time. Sure it can be, but it’s also REAL FOOD that contains nutrients. YAY FOR THE CHOCOLATE. In fact, did you know that 1 serving of cocoa powder contains nearly 8% of your daily recommended iron intake? It’s even better if you use raw cacao powder, which includes many health benefits including additional fiber and antioxidants (try adding it to your morning smoothie!). Personally I love to use this cocoa powder (it’s not raw, but it’s DELISH). But look I’m just out here trying to advocate for more chocolate in our lives, you know? 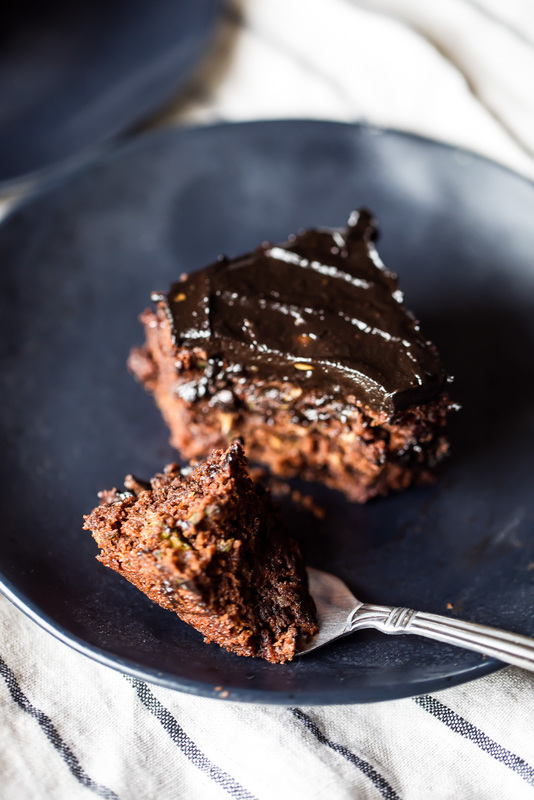 So I’ve made you this beautiful healthy chocolate zucchini cake that naturally sweetened (plus a few chocolate chips). It’s SO moist, dense yet fluffy, and absolutely AMAZING. Whole wheat pastry flour: I love using this whole grain flour in my recipes. It’s lighter than regular whole wheat flour, yet still contains the nutritional benefits. If you don’t have it available, you can always use half whole wheat flour and half regular flour. Agave nectar: I prefer agave nectar in this recipe over honey because it doesn’t have the intense flavor that honey does. 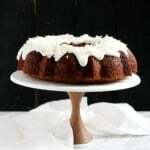 However you can absolutely use honey, maple syrup, coconut syrup or date syrup here to sweeten the cake. Coconut oil: Coconut oil works here for a boost of flavor, but so does butter or vegan butter. Or even browned butter (yummmm). Avocado chocolate frosting: So I realize that not all of you will be keen on making a frosting with avocados, but it’s SO SO good. There is a hint of avocado flavor at the end, but you can’t tell especially when it’s on the cake. 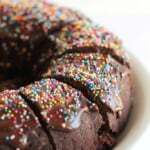 If you don’t love it, try using another chocolate frosting: I recommend Simple Mills Chocolate Frosting. I’ve also included ways to make this recipe vegan and gluten free in the notes section below, if desired. 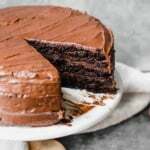 Personally I think this recipe makes the perfect chocolate birthday cake if you’re looking for something on the healthier side (especially for kiddos). Hope you love it as much as I do! xoxo. Come back tomorrow for another delicious savory zucchini recipe that you’re gonna LOVE! If you make this recipe, please leave a comment below letting me know how you liked it, or post a photo to Instagram and tag #ambitiouskitchen! 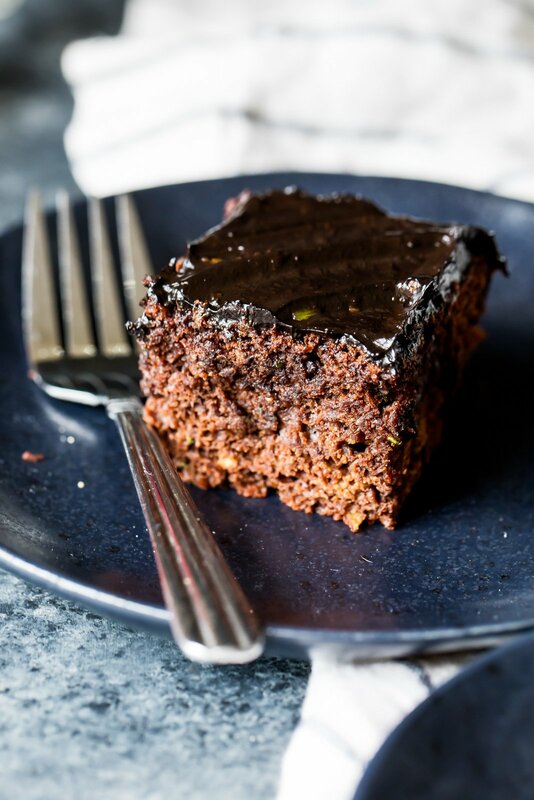 Super moist healthy chocolate zucchini cake with a silky smooth avocado chocolate frosting. Naturally sweetened & perfect to make as a birthday cake or for a special occasion. Preheat oven to 350 degrees F. Line a 9x9 inch pan with parchment paper. Spray the inside of the pan with nonstick cooking spray. In a large bowl, mix together the zucchini, egg, coconut oil, honey, unsweetened vanilla almond milk and vanilla until well combined. Next add in whole wheat pastry flour, cocoa powder, cinnamon, baking soda, baking powder and salt. Gently mix together until ingredients are just combined. Fold in chocolate chips. Bake at 350 degrees for 25-35 minutes or until tester comes out clean. Allow cake to cool on wire rack before frosting. Add all of frosting ingredients to bowl of a food processor or high powered blender. Blend until smooth and no chunks of avocado remain. Taste and adjust sweetener as necessary (you may want to add a tad more maple syrup). 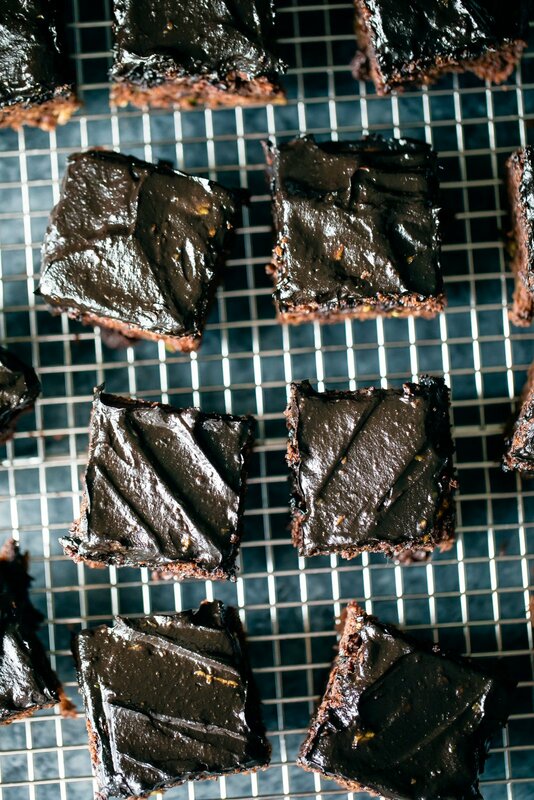 Once ready to frost, spread avocado chocolate frosting all over cake. Store cake in the fridge until ready to serve. Serves 16. Feel free to double the recipe and bake in a 13x9 inch pan. It should take around the same time to bake. Instead of honey, you may sub 3/4 cup sugar (coconut, brown or white sugar will work). Want to decrease the sugar in this recipe? Leave off frosting. To make this vegan: Veganizing this: Be sure to use agave or maple syrup and sub a flax egg (1 tablespoon flaxseed meal + 3 tablespoons water) in place of the regular egg. 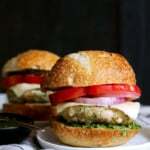 To make this gluten free: I recommend using chickpea flour or a gluten free oat flour. You can also use an all purpose gluten free flour. Toppings: Feel free to add fun toppings on the cake such as toasted nuts, sprinkles, chocolate chips, coconut, or anything else your heart desires. If you are not a fan of avocado, feel free to use another chocolate frosting of choice, or just drizzle 1/4 cup of melted chocolate chips over the top. 42 Responses to "Healthy Chocolate Zucchini Cake with Avocado Chocolate Frosting"
All of my favorite things in one! Sounds delicious!! I love that, chocolate is always popular on my IG too, ha ha! I eat chocolate every day sometimes in an indulgent way, sometimes not so much… kind of like coffee! So funny how that is, and very true on the different ways to use it and eat it! Yum! I unfortunately do not have a medium sized zucchini, can you estimate a measurement for the shredded zucchini? It should be about 1 cup! Peut-on mettre que l’avocat ou l’huile de coco, pour une version avec moins de gras? Hi! This looks soooo amazing…just wondering, is it possible to sub any of the flour for a plant-based protein powder to increase the protein a bit? Hi Hannah! It is! I haven’t tried it using protein powder, and am not sure how it will change the consistency, but you could try swapping in 1/2 with the flour. Thanks 🙂 I’ll report back when I try it! I’ve been reading a lot of blogs that are mixing avocado and chocolate in unique ways lately. I still haven’t tried them, but I’m really curious! Wow, this looks incredible! Chocolate can indeed be healthy, especially in this form! I definitely have to try making a chocolate zucchini cake with frosting! In a lot of recipies you use cocoa, can I use cacao intstead of cocoa? And instead of chocolate chips bits of cocoa?? If yes, do ihave to use more swetener? You can! I haven’t tried using cacao in these, so I’m not sure if you’ll need to sweeten it more. I personally like the chocolate chips for a bit more sweetness – adding more cocoa (powder) to replace the chocolate chips might change the texture a bit. Holy cow, this might be the best “healthy” treat I’ve ever made! I put it in mini donut pans because my daughter will eat anything if I call it a donut, and I didn’t make the frosting because I decided I’d rather have my avocado on my taco for dinner 😁 These were sooooo good! I can’t believe there’s no sugar and very little oil. Might have to make more today! Thanks so much for sharing this recipe! Omg I Just made this with the avocado frosting and it is awesome! I was trying to accommodate all my birthday guest and made this with gluten free flour… still tasted good, but SUCH a fail in terms of texture. Very dense and gooey! Ended up calling them “Brownies” and they managed to please the masses. The icing was also surprisingly good! Hi Steph! In baking the flour really defines the texture of the recipe, so I recommend sticking with the one that was used in the recipe. I’m glad they worked out as “brownies” for guests! 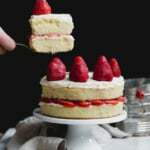 Do you think this recipe would work using two round 9 inch cake pans in order to make a layer cake instead of a sheet cake? Thank you! Made this for Easter dessert and the whole family loved it ! 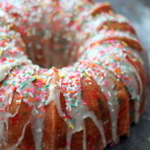 I am making this for someone with a nut allergy, for the frosting do you have any suggestions on replacements for the coconut oil? Thanks!! Hi great recipe but I had a few issues. I used coconut flour but it seemed quite dry. I did use a little bit less flour than recommended as advised on the flour packet, but then put a bit more milk in at the end as it didn’t seem wet. Unfortunately it didn’t rise, although tastes amazing. What should the consistency be? I absolutely LOVE the avocado topping! Thank you for sharing! Glad you enjoyed! It will stay good in the fridge for 3-5 days.